who's ready for tonight!!!?? i know i am! Lee elijah is so bubbly and different from her character . Here she is in the recent ep of running man. I think she's wearing Yura's outfit hehe. PS Choi team leader, ED’s assistant has a profile photo (without detailed description). It means she is now a part of the palace intrigue. I read that JNR was the only one who made the red carpet that night. Some of them had to film all night and then make it to the ceremony. It’s too bad they have to commute a long distance for any palace scene. I doubt the place is well heated. I noticed JNR wore layers of clothes underneath her wardrobe in some scenes. PS someone pointed out that CJH and SSR came to the award ceremony wearing the same kind of velvety tuxedo tops. The start of 2019 in the best acting award ceremony with #TLE team. #adorable team people. Give a lot of love TLE. I didn’t fully convey my feeling because I was so flustered. I didn’t even mention many good people who always have given to me generously. I will visit and greet them individually. I believe every one of them will know my heart without mentioning your name. And to the fans, always thank you and thank you I will boost my energy and show you a fun drama and a cool WS. MC asked JNR to sing Amor fati JNR is such a good sport. I like her live singing voice. Our Writer-nim needs tobe more creative for the romance part It's either hug or carrying SN. So He was flustered. No wonder he wasn't smile (well..only half smile) throughout the ceremony. I thought he was having a bad mood or too tired because of the filming. Dowager Empress is torturing and perhaps will murder the maid that knows her deeds which means Wang Shik did not find her in time. MYR will either truly meet her end the same way her mother met hers: A vehicle. Haha as we hv speculated . So who helped her ??? WB? So ready for tonight . I have been bored . This & TSYB, are dramas I am most excited about . Oh did our drama won some awards already? What is the occasion and award type? Sorry - I am happy but on meds so my brain is very slowwww. LH saw them and just left. Sunny is shocked and asked what is CWB doing? Reminding him about the scandal they had before. CWB told her about getting the heart of LH. And Sunny got upset and left. LH ini his room, sitting on his bed thinking about what he saw and laughed mockingly. CWB knocked and came in. LH asked about his progress with Empress... CWB updated the positive progress, LH seemingly praised him but using a raised his voice loudly and angrily. Then asked about MYR whether it has been taken care properly. Sorry, lost my stream for a while. Next scene is DE with LH talking. He updated DE that he had taken care of MYR. PM is meeting with Yoon. Yoon told him about something that surprised him. He then called a meeting, they're going to vote about something, and it is approved. PM on the phone with DE. She is upset, but he just hang up on her. It's something related to Ari. my stream is lagging so bad too.. i gave up..
Imperial family meeting with the lawyer. They can't wait for the announcement but Lawyer said to wait a while. Yoon appeared. Ari was first to greet him, while LH was angry. Yoon greeted Sunny. Lawyer announced the will, but I missed the first part. This time Sunny gets the painting of the island. But Sunny is so grateful for it. Ari is wondering what's the significance. Sojin is upset she got nothing. Yoon said something that it is after all GDE's properties, so it's up to her. DE and LH looked happy. I think they got a lot. Yoon walked out and CWB pulled him aside to talk. He handed CWB the journal of late Empress, asked him to pass to Sunny. CWB went to Sunny's room. Inside of the journal were all drawings. And inside there is an exact drawing with the painting gifted to Sunny. They both think they need to find out more about the drawing. CWB offered to help, but Sunny said she has someone who can help. It's Ari. She went to an office that have lots of computer, and she used her authority to order the people there to give her access to the computer. She got a personnel file on someone. I think it's the late Empress. Sunny gave her some food as a reward. Ari is enjoying the food (topokki) from Sunny when Nanny came and told her not to eat it because it's unhealthy. Ari got mad and scolded Nanny. Nanny looked sad and Sojin came, drunk and told her how she like it now the way Ari is treating her. Sojin also told her that LH took care of MYR before collapsing. She was happy to hear that. LH came into his room with an important document. Looking very happy. He walked over to his safe to open, but only one bill left inside, lol.... He screamed for CWB to come in, and immediately think that it is MYR. In a flashback, it was CWB who took it after getting a fingerprint from MYR when she was drunk. DE meeting with some men. Reporters? 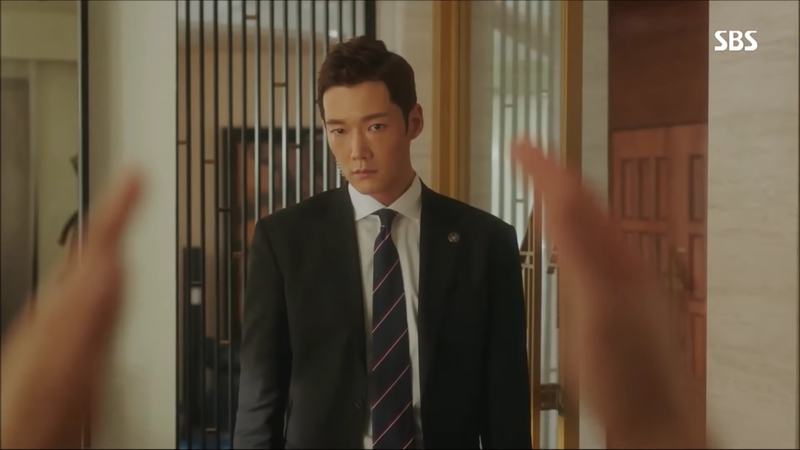 Then she has her eyes set on one of the young men, then have Sec.Choi to summon him privately to her room. She is all dolled up... (me nauseous).... She offered him to drink but he refused politely, then he took out a book by Vincent Lee and told a little bit about the story, wondering because it is like the story of Empress SH. 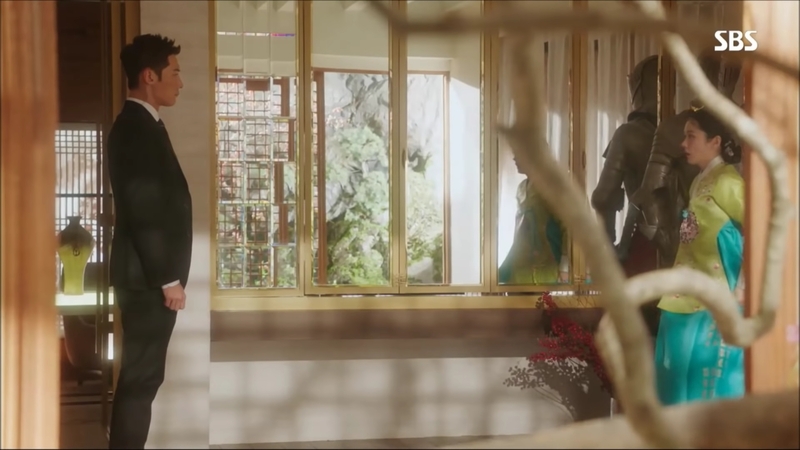 DE got so upset she screamed at him until he left scared, then DE asked Choi to get Hello to the palace. Screaming angrily about Sunny's family. LH at his desk, tasting a drink, very happy about it. Then suddenly he got angry and scrunched the paper cup. He went to lay in his bed, but suddenly feeling uncomfortable, so he pulled the blanket up to reveal the sheet covered with blood with the broken emblem piece from his car. He screamed for CWB to come in, and later CWB told him about NWS not being dead. Sunny in her room. Looking through the drawing journal of Empress SH. She followed the drawing and arrived at the conservatory. She ran into DE who asked her what she is doing there. Good thing that DE did not see the journal that Sunny hid immediately. DE left her. Then CWB came. They're wondering why DE was there by herself. As they looked further into the pages, CWB realized that someone is watching them. It is the Nanny. She returned to her room and wondered amusingly that it's just like 7 years ago, the empress with a body guard. Next scene. LH's bedroom, all dark. CWB put a pillow over LH's face to suffocate him. (stream cut off) LH is up in shocked and the room is bright, CWB was there and LH expressed his fear and anxiety. CWB told him that he would get some water and meds. When he went out, LH's phone rang, it was CWB calling LH as NWS. LH is going crazy, when CWB came in with water, he told LH that NWS is indeed alive. They talked about MPJ and MYR. LH gave him some instructions about MYR. In the conservatory. Sunny followed DE and Choi, who entered the secret torture room. They're grilling the servant of GDE, asking for the evidence. She even asked did DE kill GDE then? Finally DE ordered her to be killed because she is not giving any information. Choi injected her with something and she went limp. They went out, almost discovered Sunny, who was rescued by CWB. In the morning, two men pushing a lady in wheelchair. They got intercepted by CWB. It's the servant. Sunny and CWB brought her to safety. DE, LH and Sojin having a talk, then Sunny came, told them that she found proof that DE killed GDE. She even has a witness, just then, the servant came. She said she can testify. Sojin asked, is it really you mother? Sunny showed a recording video of DE coming out of GDE's chamber, shaken, with the blanket in her hand. Still denying the charges, but then MYR came and said that she can testify too. CWB appeared behind MYR. DE is stunned that she is still alive. LH smiled seeing that his mother is now cornered. End of episode. No preview. I don´t really understand what WB is trying to do by revealing that he (NWS) is alive. If he was trying to scare LH couldn´t he have found another way? So, I can't tell what is goimg on, buy did the lawyer read a fake will and gave the emperor the real one?